Have you had moments where you have eaten enough food but you end up feeling like you haven’t eaten anything at all? Or you get hunger pangs at odd hours in spite of eating meals on time? This is because the food you eat isn’t fulfilling the kind of energy your body and soul requires. Whatever food goes down our system is directly proportional to the energy we possess. The key to maintaining good energy levels within the body is in knowing that the food you eat isn’t just impacting your body, but your life forces (chi) are equally dependent on it. According to Vedic Chakra System, the seven energy centers or chakras within our body thrive on different kinds of food to maintain its energy level and it is susceptible to change. Therefore, our body’s demand for food might differ from time to time as well. For example, if you feel difficult to express or communicate your actual problems to your closed ones, is due to a blockage in the throat chakra and consuming juices and fruits turns out to be of great help in rejuvenating the throat. The ones who have energized the throat chakra might have blockages in the heart chakra, which is responsible for our ability to feel, love, compassion, and courage to forgive. Green-colored food, which is rich in chlorophyll, raw foods like sprouts, green teas, etc., helps in breaking the negative force blocking our heart chakra. 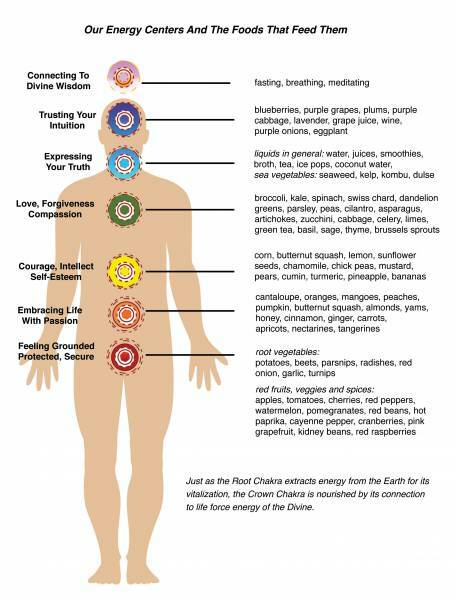 Each chakra seeks and derives energy from the food you consume. The diagram below will guide you with the list of food items required for the respective chakras. 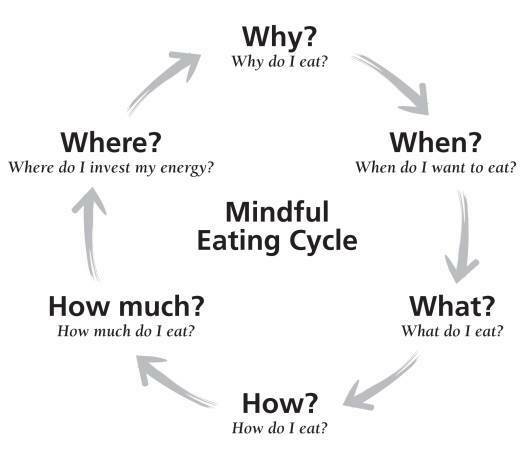 Mindful Eating is to reconnect ourselves with the experience of eating and enjoying our food, to savour each morsel, to shun all the distractions and be fully aware of what you are eating. We are living in an age of fast food, diet cans, pizza and non-exemplary amount of junk food. Come to think of it, “food fashion” is the worst thing that has happened to the food industry. The marketing gimmicks to attract consumers, making the food look good, results in an extra amount of color, chemical additives in the food which is harming us. Therefore, each time you are tempted to follow the food fad, ask yourself whether your life force would cherish that food item as well and connect yourself with the food that links to your energy vibrations. Most of the time, we cling to food to escape from boredom, hunger or exhaustion because of the scientifically proven fact that highly palatable food stimulates the center of the brain releasing dopamine (pleasure hormone). Mindful/Conscious eating is a process of choosing your food to feed your body and soul. It is knowing the relation of your food with your brain. Ask your mind and tune into your life force to know what is needed on your food plate. Know the color, smell, texture and the taste of the food in order to thoroughly derive its benefits. Moderation is an essential component of mindful eating as well. In Chinese medicine, it is recommended to eat only until you are 80% full and never to “top off your tummy,” because this weakens the digestive power of your stomach and intestines, putting too much stress on them over the long haul. Nutritionists don’t recommend finishing your food in hurry or having a serious or any sort of conversation while eating. This is because in doing so we tend to forget to enjoy our food. Just the simple act of chewing your food carefully can save yourself from multiple types of stomach disorders.